An intoxicating experience awaits us with a stroll through one of the largest flower gardens in the world. Sensory bliss which invigorates your soul, fairytale landscapes to immortalise and carry with you in your heart forever. We board the coach for a short journey through the spectacular Dutch countryside characterised by vast green fields, rivers, animals and, in the flowering season, magnificent flowers including the famous tulips, a symbol of Holland. We are greeted by a breathtaking spectacle on our arrival at Keukenhof. We tip toe around the most beautiful spring park in the world, which covers an area of 32 hectares and where at least 7 million bulbs are planted every year. Located on hunting ground between dunes and unspoilt forest dating back to the 15th century, the garden belonged to the vast estate of Teylingen Castle and was also used as a herbarium. This is where the name Keukenhof, or "Kitchen garden" derives from. This stunning botanical garden is one of the main attractions of the Netherlands and it is a paradise for photography enthusiasts. It contains over 4.5 million tulips in 100 different varieties, as well as many narcissi, hyacinths and muscari. The park is one of the finest in the country and is home to 2,500 trees of different species, a lake, canals and ponds with fountains, a windmill and several sculptures. The spring park's recent history began in 1949 when a group of bulb exporters decided to transform the estate into a permanent exhibition of spring flowering bulbs, in partnership with the mayor of the nearby town of Lisse. The first edition took place in 1950 and was an instant success. 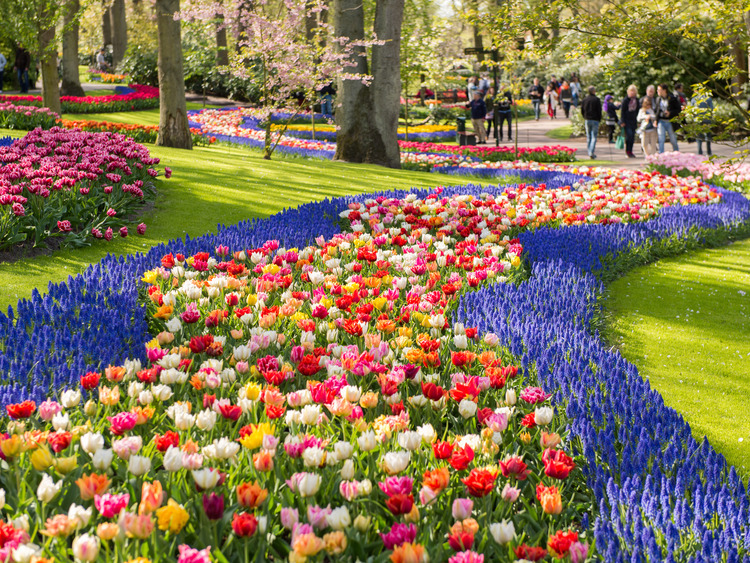 Over the course of the following years, Keukenhof asserted itself as an attraction famous throughout the world, displaying the best that Dutch floriculture has to offer, for eight weeks of the year. Every year, a representative of the Dutch royal family participates in Keukenhof's opening ceremony, demonstrating the exhibition's strong link to the royal family since its creation. Places on this excursion are limited. We recommend booking early. ?